Initially associated with hi-tech irrigated agriculture, drip irrigation is now being used by a much wider range of farmers in emerging and developing countries. This book documents the enthusiasm, spread and use of drip irrigation systems by smallholders but also some disappointments and disillusion faced in the global South. It explores and explains under which conditions it works, for whom and with what effects. The book deals with drip irrigation 'behind the scenes', showcasing what largely remain 'untold stories'. Most research on drip irrigation use plot-level studies to demonstrate the technology’s ability to save water or improve efficiencies and use a narrow and rather prescriptive engineering or economic language. They tend to be grounded in a firm belief in the technology and focus on the identification of ways to improve or better realize its potential. The technology also figures prominently in poverty alleviation or agricultural modernization narratives, figuring as a tool to help smallholders become more innovative, entrepreneurial and business minded. Instead of focusing on its potential, this book looks at drip irrigation-in-use, making sense of what it does from the perspectives of the farmers who use it, and of the development workers and agencies, policymakers, private companies, local craftsmen, engineers, extension agents or researchers who engage with it for a diversity of reasons and to realize a multiplicity of objectives. While anchored in a sound engineering understanding of the design and operating principles of the technology, the book extends the analysis beyond engineering and hydraulics to understand drip irrigation as a sociotechnical phenomenon that not only changes the way water is supplied to crops but also transforms agricultural farming systems and even how society is organized. 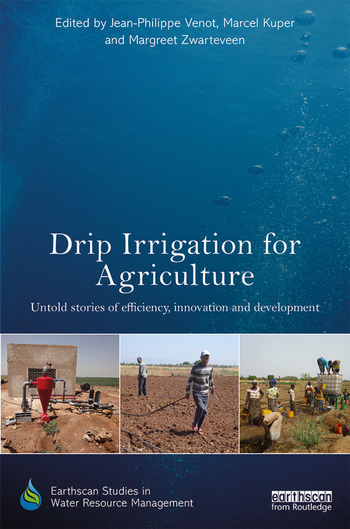 The book provides field evidence from a diversity of interdisciplinary case studies in sub-Saharan Africa, the Mediterranean, Latin America, and South Asia, thus revealing some of the untold stories of drip irrigation. Jean-Philippe Venot is a researcher at the French National Research Institute for Sustainable Development (IRD/UMR G-EAU) and is affiliated to the Water Resources Management group of Wageningen University, The Netherlands. He is currently based at the Royal University of Agriculture in Phnom Penh, Cambodia. Marcel Kuper is a senior irrigation scientist at the International Agricultural Centre for Research and Development (CIRAD/UMR G-EAU), France, and a visiting professor at the Agricultural and Veterinary Sciences Institute Hassan II in Rabat, Morocco. Margreet Zwarteveen is professor of Water Governance at IHE Delft Institute for Water Education, and at the Governance and Inclusive Development Group of the University of Amsterdam, both in the Netherlands.